Because we know you need information to make informed decisions, we have taken the time to list the questions asked most frequently. If your question is not listed, please give us a call and we will be happy to answer it. If we don't immediately know the answer, we will do our best to find the answer and return your call. We answer our phones from 8 am - 5 pm, Monday through Friday. "Asphaltic Concrete," is normally known simply as asphalt, is a composite material of choice used for the construction of paved roads, highways, parking lots and playgrounds. It consists of an asphalt binder and mineral aggregate mixed together, it is laid down in layers and then compacted. What causes my asphalt to deteriorate? There are many things that cause asphalt to fail. Rain and irrigation can play a major role in the deterioration of your asphalt, especially if it has not been properly maintained by seal coating, crack filling and patching on a regular basis. 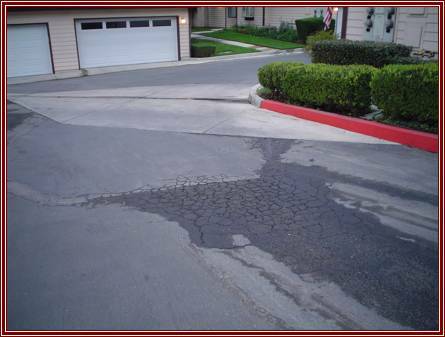 The water erodes away the fine materials and aggregates which keeps your asphalt in tact. In areas that hold water, the water seeps into the sub-base and causes the base to degrade and become spongy and unstable. This allows your asphalt to develop small cracks close together creating "alligatored areas," which break apart and create "potholes." Motor oil, gasoline, and other petroleum products also breakdown your asphalt if they are left to soak in without the protection of seal coat. Heavy trucks like garbage and delivery trucks can cause your asphalt surface to flex and crack if the base under the asphalt lacks the proper support for the vehicles. After a period of many years without the proper maintenance, the asphalt simply "wears out". Water run-off creating "alligatored" areas. Why are there small puddles in my new asphalt? Although we make every effort to provide smooth and even asphalt, sometimes small puddles are a common occurrence. Most driveways and parking lots laid with asphalt have small indention areas called "bird baths." Because of the nature of the ingredients in asphalt, we can't achieve a perfectly smooth and uniform surface. Why does my asphalt look like it has holes in it? During the process of asphalt installation, it is normal to have some minor separations called "pockets". Asphalt is made of aggregates and rocks mixed together evenly. The size of the rock in your asphalt and the amount of separation determines the size of the pockets. The bigger the rock, the more durable the asphalt, but the bigger the pockets. You can drive on your new asphalt after it has had a chance to cool. Depending on the job, it can sometimes be the same day. Seal not only enhances the beauty of your asphalt, it increases the lifespan of the pavement by slowing oxidation, water penetration, and surface raveling. It protects your asphalt by filling in the smaller pores. It prevents the penetration of moisture and the effects of gas and oil, which ultimately leads to the deterioration of the surface. Lastly, it hides changes made in your parking lot striping layout by covering the blacked out lines. When can I seal my new asphalt? It is recommended to seal your new asphalt 3 - 12 months after installation after it has had time for the asphalt to completely harden. When can I drive on my new seal? It is recommended to stay off your new seal one to two days before driving on it to allow the seal coat a chance to cure and to minimize the amount of power steering marks. Why do I see powering steering marks in my new seal coat? Power steering marks do not indicate a material or workmanship defect. They are marks caused by vehicles that make tight turns on your new seal coat. The marks will buff out with time. When and how often do I need to seal my asphalt? It is recommended to seal your asphalt about every two to three years depending on traffic, rainfall, and irrigation run-off. How long before I need to re-stripe the lines of my parking lot? For Retail Centers, Industrial Buildings, or Commercial Buildings, with normal rainfall and use, re-striping should be done at the same time as the seal coat which should be done every couple of years. What is the process for crack filling? Your asphalt is first cleaned of dirt and vegetation. Hairline cracks are usually filled in by an application of seal coat. For cracks 1/8 and larger, we use either a cold or hot pourable crack filler. 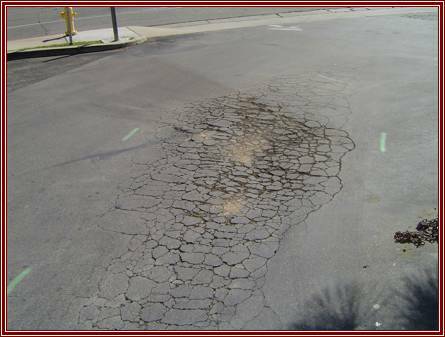 For larger cracks , we use hot asphalt to fill in the cracks. and we'll be happy to get an answer for you.